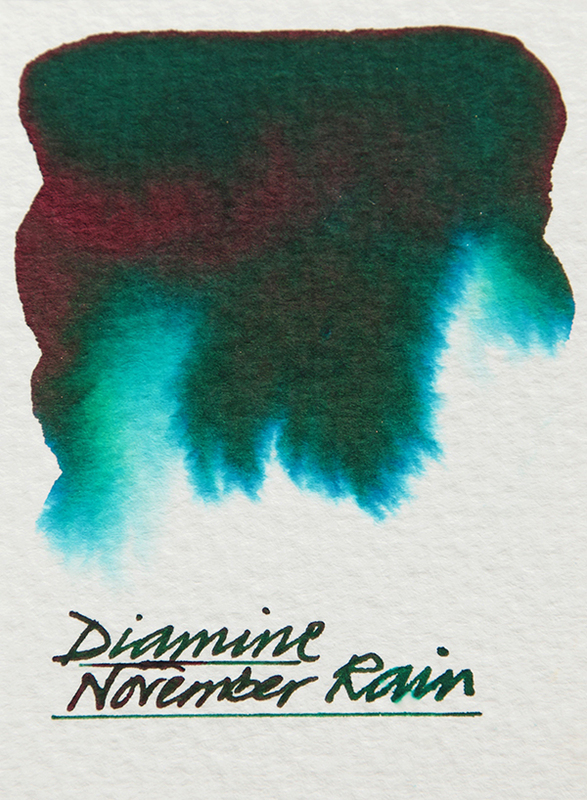 Diamine are about to produce another German exclusive - November Rain. A deep almost holly green with blues and lime greens when washed with water and a shiny rusty crimson coloured sheen when viewed at an angle in bright light. Edited by NickiStew, 20 June 2018 - 13:44. I usually do not use greens, but have recently been craving them and looking for a certain color I cannot quite pinpoint. This may be exactly what I was looking for. Any advice for tracking some down in the US? 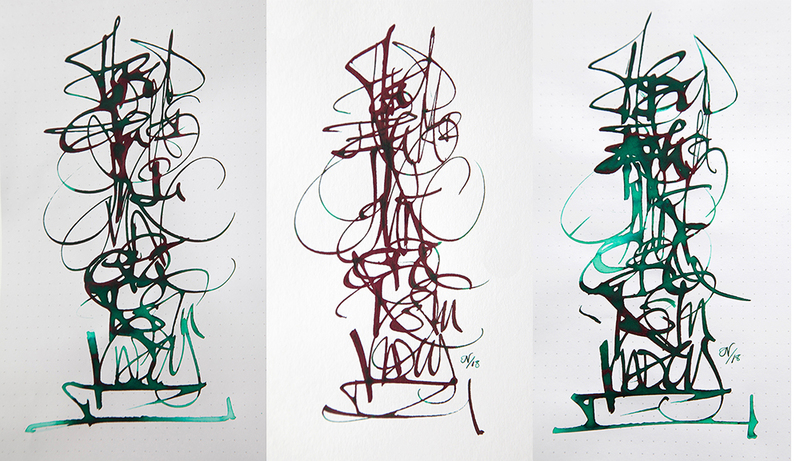 Does Diamine include the German exclusives among the colors sold directly by the manufacturer? Or would I need to buy from a German retailer? Edited by goodpens, 20 June 2018 - 15:27. Shame on me, I don't like green with red. 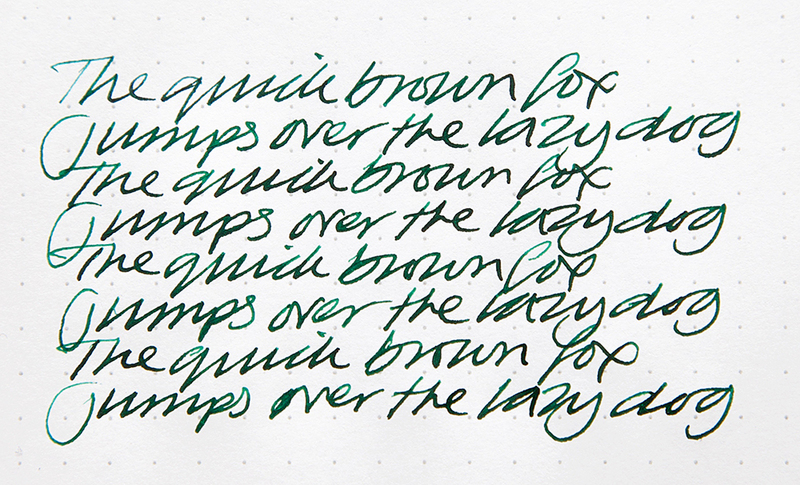 Otherwise a really nice ink that will find its buyers. I have the skull and roses and absolutely love it. Is there another colour to come? Looking forward to this ink. Let us all know when it becomes available! You think they named the ink after the Guns N Roses song? Ohhh,love this color, I'll definitely try it! Forget what I wrote. Had a few closer looks and ordered it. And the next sheeny , shiny one will get me too, I bet. Edited by sanphoemo, 24 June 2018 - 18:54. Reminds me of their Sherwood green, which is also very green with some reds. But certainly not the same. 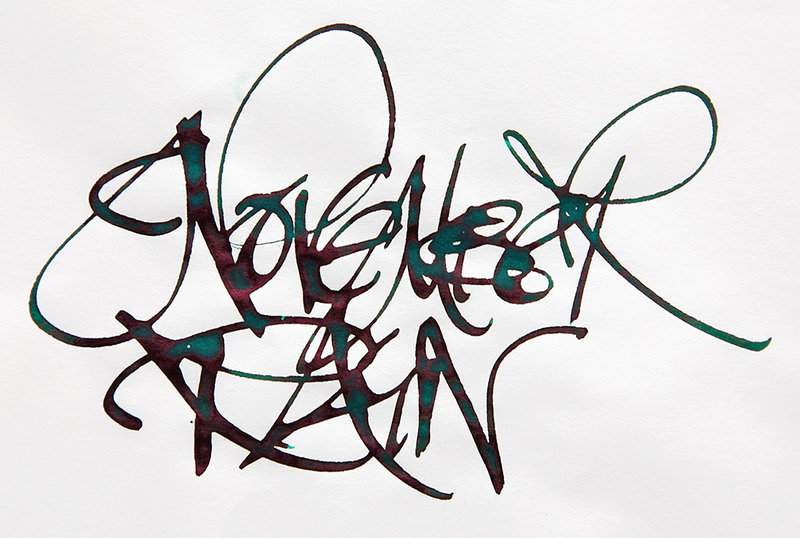 Never mind, nowhere near the sheen. Edited by bizhe, 25 June 2018 - 02:12. We all want to know where you ordered it from?? It seems to be the first shop that has this new ink. There sure will be more offers in other shops. Edited by sanphoemo, 25 June 2018 - 05:35. I just placed an order with https://www.fountainfeder.eu/. This is my first time ordering from this German company. It has very reasonable shipping rates to the US, great customer service (clarifying a glitch I encountered on the website during my order), and my package shipped in less than 12 hours after I placed rhe order. 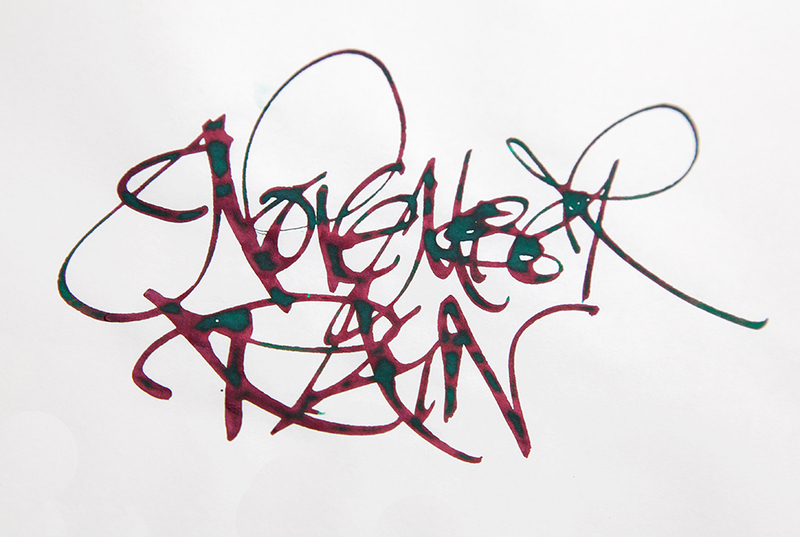 Very pleased so far and looking forward to getting November Rain and the other inks I ordered. Hope they introduce it in the UK. Could name it December Sleet, perhaps. I just found it on fountainfeder.eu too. Their shipping prices are very reasonable. They still work out 75% more expensive (when buying 4 bottles) compared to buying local. Maybe they will launch it in the UK with a different name. Here in USA the regular Diamine 30ml bottle is sold for 7.50 USD so to me still is a good deal with shipping! Also I got many from Cult Pens and still is almost 50% cheaper than US retailers.